Thanks to Julie Carlson for her work in updating our local business list. Periodically, the Duluth Township Newsletter updates a list of local businesses in an effort to make them known locally and to encourage their support and use. Each known business was contacted for updated information. New businesses were added from official business databases and our Newsletter also had requests for updated information. This list of businesses has been checked over by knowledgeable local residents. Our best guess is that there are many more active small businesses than are listed. If we missed your business, please let us know. Small businesses are important to our Township and region. Support your neighbors and their local businesses! Home, office, cabin cleaning, mending and ironing. Call for estimate. Repair of violin family instruments (violin, viola, cello, bass). Repair/re-hair bows. Handmade mountain dulcimers, custom made per individual order. 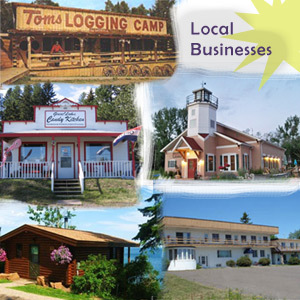 Timber Ghost Realty, 390-6663, working with buyers and sellers of land, cabins, farms and rural property in the Duluth-Superior region. Quality tenant finder for landlords. Lessons and training by appointment. School horses available. A cottage business providing small computer repair, maintenance and upgrades as well as photocopying services to French River, Clover Valley and surrounding communities. Please call in advance for appointments. Seasonal, on Lake Superior at McQuade harbor. Installs Amvic ICF foam products, slabs, foundations and stonework. Custom Lake Superior Spoon and Fish bait boxes. Custom metal work. Open Wednesday through Sunday, 1-4pm or by appointment. Custom homes, additions and cabinets. Home construction. Repair, liners, rebuilds, masonry restoration. Exterior and interior painting and staining. Commercial and residential. Spray booth on site. Garden dirt, driveways, sand, gravel, limestone, rock and machine work. Firearm and concealed carry classes individual instruction. $37.50/person. Call for more information. Comfortable eating, affordable prices with a lake view. Catering venue for weddings, showers, parties, receptions. Call for information. Hand poured candles helping you scent your corner of the world. Maple syrup, rough-cut lumber, etc. Healthy, sustainable food. Poultry and hogs, fruit and vegetables. Produced organically. Publishing quality books by women of the northland. Infants to School Age, Licensed, Bus to NSCS and Lakewood Schools. Accepting full and part time. Freelance court reporting services, including depositions. For-hire trucking experience since 1985. Enjoy year round, picturesque setting directly on the shore of Lake Superior. All cabins have lakeside decks, BBQ grills, kitchens, fireplaces. A great vacation spot for all seasons. Carpentry, residential new and remodeling, cabinetry. Black dirt, top soil, backfill, sand and gravel. Commercial and fine art photography. Plumbing, heating, air conditioning, geothermal. Old world style masonry, custom stone and brick. The Kantele Shop is a source for traditional Finnish folk music instruments built in the woods of northern Minnesota. Vegetables, flowers and fruit. Grown in accordance with Organic standards, no pesticides. Sold through Duluth Farmers Market. Garden consultations, design, and maintenance; selective planting jobs. AAA, Jump start, door unlock, tire change, fuel delivery. all credit cards accepted, local and long distance towing. Custom brick and stone, new and repair, Quality that lasts. Open seasonally about March through June, 10-6pm Tuesday through Sunday. General contractor and carpenter, residential and commercial license, new homes and remodeling, licensed and bonded. Working with warm water fish, streams and inland lakes. Working with coldwater fish and streams, North Shore and Lake Superior. Open daily at 11am. Contemporary American cuisine. Casual, relaxed atmosphere with a great lake view. Large selection of imported wine and beer. Surveyor GPS, drafting, mapping, property lines, in MN & Wisc. Handcrafted log and timber framed structures By appointment. 6592 Homestead Road, Pet grooming. Call for an appointment. Peak Construction Roofing, 525-5478 or website: www.peakroofinginc.com Eric Simonson and Bruce Schlecht. New construction and re-roofs, shingles, flat roofs. Gravel, septic system construction, excavation. Specializing in miniature roses, minifloras and tree roses. Seasonal May through Sept. Call ahead for open hours. Prospect Farms is an equestrian center with an emphasis on “riding in harmony” with your horse. We offer lessons in dressage, jumping, western and recreational riding. We are open year-round. Please call for an appointment. Pet crematory, burial and services. Arrangements through local veterinarians or by phone. The best insulation for existing homes. Freelance technical writing. Creative writing. Custom made, hand thrown pottery. Mugs, bowls, casseroles, vases. Seasonal, Unique gifts, handcrafted items, gifts for all occasions. Insurance work and auto body repair. Quality remodeling and carpentry work of all types. Carpet cleaning, window cleaning and disaster restoration. Serving the North Shore to Grand Marais. We also own Bay Breeze Laundry in Two Harbors. Pick your own certified organic blueberries in August. The best care for your pets in the comfort of their own home. Wood turner and reliable renovation. Custom cabinetry, high quality woodworking. Rough sawn lumber for your projects, yard /wood shed, raised garden beds, etc. Land use design, community planning and residential design. Spray polyurethane closed cell foam insulation. Residential and commercial, new and remodels. Insured. Carpet showing in the comfort of your home. Seasonal. Visit authentic logging camp replica. Eight museum buildings, gravity house, nature trail, llamas, chickens, bunnies, goats, rainbow trout, moccasins, jewelry, gifts. Manufacturer of specialty performance industrial coatings for wood: environmentally compliant stains, paints, sealers, coatings. Long and short term boarding. Call for reservation. Custom cutting and wrapping of all types of meat. Light backhoe and dozer work.